Wipro Recruitment 2018: Are you one of the candidates who had completed their education and looking for the Job then you are at the right place. Recently the Wipro had revealed the notification Wipro Careers 2018 For Fresher candidates. Many of the candidates are dreaming to work in the MNC company and seeking hard to fulfill it. For those candidates, this Wipro Recruitment is a wonderful opportunity. In Wipro there are not only software related jobs there are other jobs in various categories like Business Processing Outsourcing, Networking, Testing etc. Candidates who are flexible to work in any shifts with full of responsibility can apply for the Wipro vacancies by knowing whether they are suitable for the jobs listed in this article or not. As we all know that the Wipro will conduct the Wipro Recruitment 2018, walk-ins, Campus, Off-Campus and referral drives across the country in different cities such as Chennai, Bangalore, Pune, Mumbai, Hyderabad, Gurgaon etc for the candidates who had completed the B.E/ B.Tech/ M.E/ M.Tech/ MCA/ B.Sc/ BCA/ Any Degree. Contenders who are having the successful track record in the academic with the best knowledge in the core subjects are eligible to apply for the Wipro Careers 2018. In the consecutive section of this page, we have furnished the eligibility details in an understandable manner. So candidates can come to an idea about the recruitment and apply before the final date. The officials of the organization are planning to recruit the contenders for various positions by checking the capability of the aspirants by conducting the written test. All the freshers can utilize this opportunity by applying into the official website www.wipro.com. By scrolling down this page the applicants can get the complete information about the Wipro Recruitment 2018 in a brief manner. 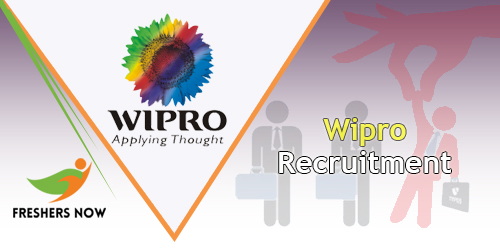 Usually, the Wipro recruitment panel will recruit the skillful and talented contenders based on the requirement in the company. To get the job in the Wipro company candidates have to work hard in their preparation by using the related stuff. Wipro is known as Western India Palm Refined Oils Limited and in most recent times it changed to Western India Products Limited. The Wipro Limited is founded by Mohamed Azim Hashim Premji on 29th December 1945. The Wipro is an Indian Information Technology Services corporation and also a leading global information technology, consulting and business process services company. Wipro entered into the technology business in 1981 and has over 140,000 employees and clients across 54 countries. Wipro has been ranked 1st in the 2010 Asian Sustainability Rating (ASR) of Indian companies and is a member of the NASDAQ Global Sustainability Index as well as the Dow Jones Sustainability Index. The company consists of 1,60,000 dedicated employees serving clients across six continents. Strong programming skills in C, C++, Java and some other related programming languages related to the post. Responsible for development, support, maintenance and implementation of a complex project module. Should be able to work as an independent or also as a team member. Ability to lead the project team in normal manner and delivery the result in time. Have to complete the education with the good score. All backlogs have to be cleared at the time of attending the Interview. The online test consists of questions from various domains like Quantitative Aptitude, Logical Reasoning, Verbal Ability, Basic Programming and Computer Fundamentals. Sometimes there is a possibility to conduct the Group Discussion for the applicants after the online test to filter the aspirants to the next level. The candidates who got selected can expect the salary of 2.4 lakhs to 3.5 lakhs per annum. The pay scale may vary from role to role. Contenders can also have incentives and hike in the salary according to the performance in the allotted project. Go to the official website of the Wipro that is www.wipro.com. Scroll down the page and find out the “Career” tab. A page will appear with the location wise job openings. Candidates who are applying have to select the particular role and click on it. Now this redirects to the page with complete description and responsibilities about the role. If suitable apply by clicking the “Apply Now” tab. Enter all the necessary details and submit the application form. Save the id and password displayed on the screen for the interview purpose. Wipro Desktop Engineer jobs needed.